Fantastic weekend here in Worcester, at the lovely City Church. Long (time) drive to get here, from Addlestone, after picking up my car, due to major accidents on the ‘road to hell, the M25, and both carriageways being closed for ages…. but it was worth the frustration. It’s been really lovely staying with my great friend, Graham Coyle, part of the Leadership team of the church: its the first time I’ve been with Graham since his equally lovely wife, Ann, went to be with Jesus 3 years ago. there are very few positive adjectives to do with personality and life that didn’t apply to her. Graham is a man it’s a true privilege to call a close friend – a strong, gentle visionary with an immense love for people. So it’s always such a blessing to be in their home, and it’s a tribute to Graham that it’s still a real joy to be with him. We’ve been great friends since our time together at Roffey Place Christian Training Centre, in 1984, so we go back a long way! I’ve said recently after meetings, that’s it’s such a blessing to arrive at a church, and hear testimonies from the previous visit – 3½ years ago in the case of City Church. Here, I was blessed to hear of deression, anorexia, reynaud’s syndrome, osteoarthritis, and other diseases and afflictions being healed. It’s been a busy weekend, starting Saturday morning, with (what should have been!) a 2 hour session on healing, that in fact, turned into a near 5 hour session with praying for people. There were a number who experienced immediate relief from their symptoms, others who felt a change…. one lovely friend, the wife of a couple, who’d been very ill in recent weeks, experienced a real change in her symptoms. More testimonies from Saturday were shared yesterday morning in the Sunday meeting, and a lot of people prayed for – by the leaders locally, as well as me, which makes life just a little easier! There were a number to pray for in their homes, too, who couldn’t, for one reason or another, make it to the meetings. As always, I look forward to hearing at some stage, some of the testimonies – even it’s not until I come here again, if they’ll have me! Tomorrow, I head for Welshpool (if you don’t know where it is, the clue is in the first part of the name!! 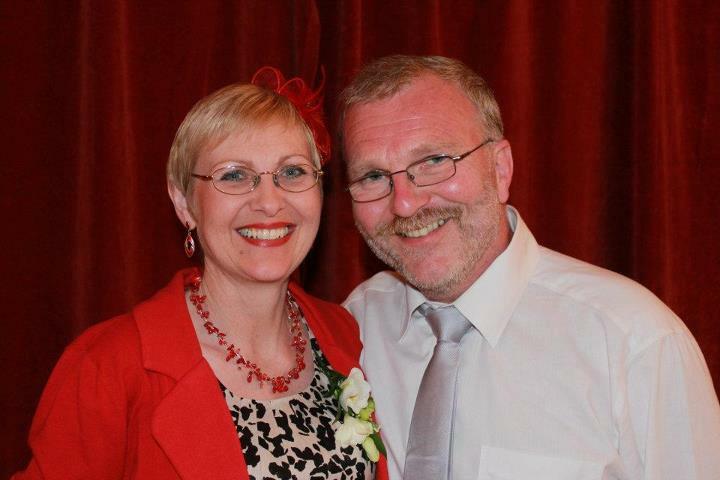 ), to a meeting – ‘The Filling Station’ – where long time friends Jonathan & Kathryn Crosskey, are part of the leadership. Our friendship, like with Graham and Ann, goes back many years, into the ’80’s, in Worthing, West Sussex: there’s a rather unique ‘link’ with them, too, in that, in 1994, in taking me to Heathrow Airport, Kathryn and I were involved in a car crash that – humanly – should have killed us both, but we both escaped without a scratch (it wasn’t Kathryn’s fault, I want to point out! – it was the fault of the truck driver behind – something to do with a mighty angel who’d turned up at church the weekend before Jonanthan & Kathryn’s car – a geriatric Mini Metro – was crushed between two aticulated (18 wheel semis, for American friends) trucks, with us in it….. What made it more interesting, is that it was in the morning rush hour, on the M4 motorway exit ramp to Heathrow Terminals 1, 2, and 3…. It would be an anti-climax to three days of great meetings at St Hilda’s Church, Seymour Hill, and a last meeting of the Easter mission at Kilmakee Presbyterian Church, to say they hadn’t gone well. Well, they were terrific – again, on the way into church, people stopped me to say that they’d been healed on Friday evening (there wasn’t a meeting on Saturday, just the 5 between Wednesday and Friday). During the course of the days in Seymour Hill, many people received a real healing from God, many began the process: it was a large number, borne out by the fact that each evening the ministry time was always in excess of 2 hours – often near 2½ hours. It’s hard to explain how exhausting it is being the pray-er, unless youve done it! I know that today I’ve been absolutely shattered, and through tiredness, didn’t take enough care and twisted one of my knees 🙁 – fortunately, it seems to have done no lasting damage, only to muscle! It was lovely to have Davy King and Thanney Pyper with me all day Sunday: I’d hesitate to say how many people we prayed for, but it was a lot, and there were a number healed on the spot, and others knowing the process had begun… lovely clebration of Easter with some really lovely people, who seemed to welcome me as a member of their family, Thanney and Davy too…such a powerful presence of the Holy Spirit in both meetings, lovely worship, and God touching lives with healing to celebrate Jesus’s resurrection. Another terrific meeting last night, in Seymour Hill, St Hilda’s Church of Ireland. It’s been so good to see numbers increase each evening: often, in a (near) week of meetings, numbers decline, especially on a national holiday day like Good Friday. Thanney Pyper went with me, and shared really well about his own story of God taking him by surprise in Colombia last October/November, and telling of some of the miracles that not only had he seen, but that God had used him to do….he’ll have been a real challenge to the many men who ‘fill pews’ every Sunday, and do nothing for the Lord! Lovely, long time friend Elizabeth and her husband, Eric, are part of the leadership team at the church, and involved in the healing ministry themselves. Last night, Elizabeth was very blessed by Jesus: Eric had told me she was in a lot of pain, especially her hips, and she hardly slept. Elizabeth has had major problems, and a great deal of pain, with her hips for as long as I’ve known them. There was nothing doctors could do for her, not even cortisone injections, as she had some issues with her heart, too. This morning, I had a text message from her, to say that she was completely pain-free! And in the night, she woke, with the feeling that her arms and legs were being pulled, stretched – I can only imagine it was God readjusting her body! So as Jesus never half healed anyone, I’m sure that he was rectifying her heart, too…. Something similar happened on my way in as happened the eveing before: on Thursday, I’d prayed for a lady who had a terrible lung condition, breathng was extremely hard for her, her lungs, already damaged for years, had been further damaged with lesions as a result of a major pulmonary embolism 18 months ago. She needed oxygen at night, which she hated as it affected her sleep. She suffered, too, with sleep apnoea. She wasn’t at the meeting, but her sister was. She told me that her sister had had an appointment with her consultant concerning her lungs, which, she’d been told, would only get siginficantly worse, and deteriorate quite quickly. The doctor didn’t make her wait for the results of the scans/x-rays, he told her what they were, as he couldn’t believe it…. her lungs were completely clear, no scarring from the embolisms, and the blood tests (from which she told me they determine sleep apnoea) and her blood was completely clear. She’d had a day of breathing easily, sleeping well, and with more energy than she’d had for years….. Thank you, Jesus!! As we celebrate this amazing weekend in world history, it’s incredible to think that the King of Kings, the Lord of Lords, Creator of Universes, Giver of Life – came here for me. And you. He’d have come if had JUST been for me. Or you. And as hung on the Cross of Calvary, he looked down into history yet to happen, and saw us – and his love overflowed for us. Our eternal security is an incredible promise for all who know and love him. Years ago, I read something that the lovely Max Lucado, the American writer, wrote. I don’t know which of his many books it was in, but he wrote some life-changing things in his books about Easter – ‘No Wonder they call Him the Saviour’; ‘And the Angels were silent’; ‘He still moves Stones’; and ‘Six hours one Friday’. All are wonderful, and well worth reading. The battle is won. You may have thought it was won on Golgotha. It wasn’t. You may have thought the sign of victory is the empty tomb. It isn’t. The final battle was won in Gethsemane. And the sign of conquest is Jesus at peace in the Olive trees. For it was in the Garden that He made his decision: HE’D RATHER GO TO HELL FOR YOU, THAN GO TO HEAVEN WITHOUT YOU. Those same hands that created the universe will wipe your cheek. The same hands that clenched as a Roman spike smashed through them, will wipe your face, and wipe your face, and brush away your tears – FOREVER. Whatever pain we suffer, whatever mental anguish we endure, whatever trauma we’ve faced or face – none compare to what Jesus experienced 2000 years ago. We know that he experienced everything that we do, and he understands. And by His stripes, we’re healed. It’s a constant amazement to me that there are still so many people who don’t believe that God does miracles, and heals, today. Why would he still save – the primary purpose of the Cross – and not heal, when so many Scriptures tell us that he and his Father long for our healing? I am SO glad that he saves: God only knows who, what, or where I’d be, if Jesus hadn’t saved me. And healed me…. 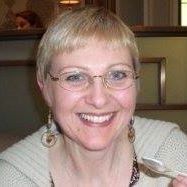 healed, when healing didn’t happen in churches, in the 1960s, of celiac disease: healed of life-long back pain when I was 18 – I was born with a hole in my spine, if I remember well it was a ‘small spina-bifida of the neural arch, less than a centimetre from being a full spina-bida victim. And 5 weeks ago, the miracle of osteoarthritic knees being healed. All three of those things are medically and humanly incurable. The last couple of nights, I’ve had the privilege of speaking at a lovely Church of Ireland, St Hilda’s, in Seymour Hill, Dunmurry, Belfast. 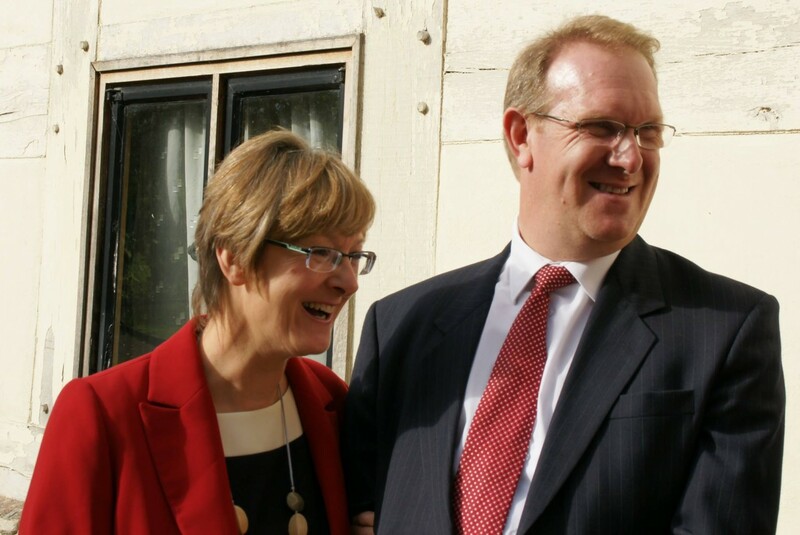 The Rector, David Boyland, and his lovely wife, Glynis, know, too, the miracle power of Jesus, when Glynis was unbelievably ‘miracled’ some 4-5 years ago. The faith expectation that they have sown into their church must be unique: and over these two evenings, God has done some wonderful things. A lovely lady, Marguerita, had asked for prayer for a totally deformed spine, which for the previous 20 years had given her 10/10 pain, 24/7. I’ll get the name of the condition at tonight’s meeting, maybe even a video of her if she’ll let me….she hadn’t been able to stand upright, ever, was on massive pain killers, and the condition was totally incurable, not even really manageable. She had taken only one pain killer yesterday (and that, she said, was because she’d had no pain, and done too much in the day! ), and she stood upright against a wall, and was almost perfectly straight … normally, she told me, her head was tilted forward at about 45 degrees. She testified in the meeting to the miracle that God had done for her. Thank you, thank you, Jesus!! Maureen, 89, has begun to experience better vision after years of cataracts, and had new strength and energy yesterday, like she’s not known for many years. Other spinal conditions were healed or eased: as always, knees got healed (I’m so glad that God is still healing knees even though mine are now so massivley better! – I prayed that he’d keep doing it even once my pain had gone). There were many other diseases, infirmities, and ailments, that God touched: I’ll find out more tonight! I’m there on Sunday morning, too, and then with St Hilda’s, the Methodist Church, and the Presbyterian churches, on Sunday evening. Heaven touched earth with the love, mercy, grace, and healing power of the risen Lord Jesus: I’m praying that what’s been happening in Londonderry will break out big-time in Belfast and all of the ‘satellite’ towns around it. And then spread across the whole of this lovely province. Passion to see God do in the ‘west’ what he does in other places….and the blockages! I’ve often had other preachers on at me that I MUST charge, MUST promote myself, MUST go after ‘big’ platforms and churches…. some have suggested that I need ‘ministry’ because of my determination NOT to charge. It’s as though they see it as a weakness. Could it be that they feel guilty charging, when it’s evident that God’s looked after me pretty well up until now, NOT charging? I can’t answer that – maybe you have a take on it….? My ‘problem’ is that God told me NOT to: and to be perfectly honest, I have absolutely nothing to offer God, or anyone else, come to that, that is worthy of charging for. All I have is what God has given me – FREELY I’ve received, so FREELY I’ll give. I can’t actually find where charging for ministry fits into what Jesus said in Matthew 10:8. I’m also fairly certain that Jesus – when he was ‘out on the road’ with the disciples – didn’t charge to preach…. (!!) – or pray for people…. I’ve had ‘the labourer is worthy of his hire’ thrown at me more times than I can shake a stick at, more times than I care to remember: but that’s ‘hire’ – not charging for services rendered. To me, that’s down to the people I go to who CAN afford to cover my expenses, and give me a gift. There are times when what’s given bears absolutely no resemblance to what it’s cost me to prepare, fly from Northern Ireland, drive from Heathrow area, preach, pray, and then do the whole lot back home again… there are other times when people are generous, too, but that’s not why I do it. It’s probably NOT a ‘swings-and-roundabouts’ situation: It’s more like to be a red number in the deficit column, but that’s God’s problem, not mine. Within a week, after much frantic praying, God, through a lovely Brethren evangelist friend, gave me a less than a year old lovely Chrysler Alpine. God is no man’s debtor. Somehow, 38 years on, it’s still happening. I don’t have a mortgage anymore – I don’t own a house! – that finally went at the end of 1983, when God said to use the equity to go through a Christian training centre for 9 months, to equip me for the next phase. Whether it DID equip me as much as I hoped, I don’t know: what I DO know is that God has been unbelievably faithful to his word to trust him, for home, security, and income. I DO long to preach more in the United Kingdom and Europe: not because I feel that the worldwide travelling is coming to an end – just the opposite, in fact, but because I passionately want to see God do in our western world what he does in South America, Africa, India, the far east. But one of the ‘problems’ of staying under the radar, where I’ve always wanted to be – (I pray so often that I’ll NEVER want the spotlight; I actually find it hard when people do publicity about meetings I’m speaking at – especially if they’re advertised as ‘healing meetings’!) – but the ‘downside’ of that is that it’s almost impossible to get preaching invitations in the UK and Europe, because not too many people have heard of me! There are a handful of churches that I go to with some regularity, for which I’m really grateful. Unless, of course, lots of people HAVE heard of me, and just plain don’t want me…. 🙁 !! I so want to see God break out in the ‘open heaven’ type environment that all who go with me, to Cali, recognise. I ummed-and-ahhed about posting here some of the things that were said to me in Cali, but I can’t do it. I hate ‘promoting’ me, even more I hate fund-raising for me (with a passion) though it is essential…having lost over £350 a month (a very large chunk of my regular support, I’d add) – all for good and valid reasons, 2 deaths, a redundancy, perfectly reasonable things like that. Stewardship, who are marvellous in the ministry that they have to people like me, processing support and claiming back the gift aid, suggest a minimum number of days a month to ‘support raising’ – if I’m honest, I can’t do that either! I have no problem in trying to raise support for people and projects that I’m involved with, like the current project for the street kids in Cali, and the El Abrigo Foundation, or for Dr Ana Bustos’s street kids project, Ana Beiba’s Abandoned Old People’s project, and so on. Lots of people say they don’t support me because they’d be embarrassed – only £5 a month or so. You know something? 100 people giving £5 a month would be wonderful. I’ve got 3,500 ‘friends’ on Facebook: I have 2,000 on my own mailing list: 800+ who receive this blog by email: and, in the period of time I’ve been using this format for the blog, almost 70,000 have read it, and many say that they pass the email version on to other people. I pray that maybe 500 out of all those numbers (more than 75,000) might, just might, say that for the cost of a Costa Coffee or a Starbucks a month, they could revolutionise what I do! I have such a passion to go to the poor: to see their lives (which make my life look grossly affluent) transformed, with practical, personal, and spiritual help, with healing, so that they don’t have to worry about not being to afford the doctor/surgery/medication. 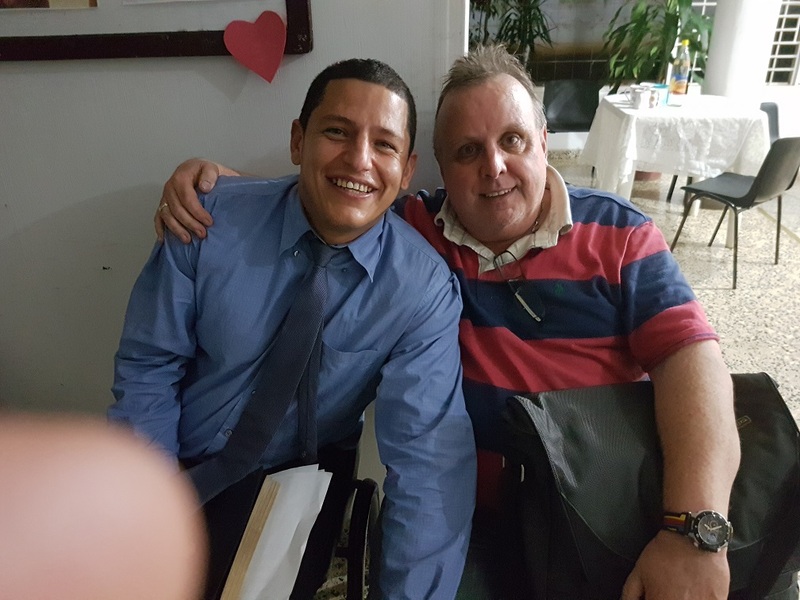 And I love that I’ve been able to facilitate a lot over the years, through the kindness of amazing people in the UK and elsewhere, like you, for dear Ana Beiba, for the El Abrigo Children’s Foundation, for the lovely Dr Ana Elisa Bustos, and others…. Should I charge for what I do? NO, most certainly not. God said no, and in 39 years, I haven’t: I’m still alive, still breathing, still travelling, and hardly anorexic! (Though in truth I don’t eat a great deal, I have the metabolism of a dying slug!!). God’s been a faithful provider, not ALWAYS when I’d like to schedule the provision, but always when he knows I need it. If I did charge, I’d never go, because many places couldn’t even begin to afford even the accommodation, let alone the cost of getting there: so God knew where I’d be at 38-39 years ‘down the line’ when he said that I was never to charge. How on earth would people in Colombia, Romania, Africa, India, the far east, and other places (which will be back on the agenda in the coming years), ever be able to finance a trip? The airfare to Colombia alone is about 15 times what most Colombians earn in a month. I find it hard enough when, in a desperately poor church, that sometimes they want to give me the offering. I try and refuse it, but it offends them if you do. It might be the Colombian peso equivalent of £2-3. It means more to me than a lot of other gifts, I’m sure you can understand that!! Obviously, I can’t ‘invite’ myself to other churches to speak(!!) – I wouldn’t, even if I could – my desire is to see God do what he does in other countries, and give other people opportunities to let them see that God can do more with them than they’d have ever dreamed possible…. 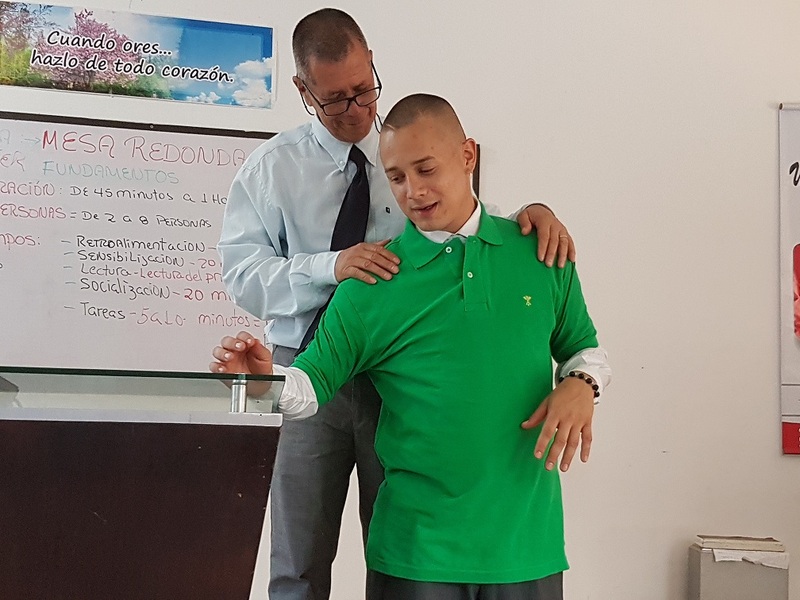 In November, at the Reconocer Christian Drug Rehabilitation Centre, Cali, Thanney Pyper & I prayed with a 14 year old young man, Pedro: it just felt right to let Thanney take the lead, being a lovely family man. 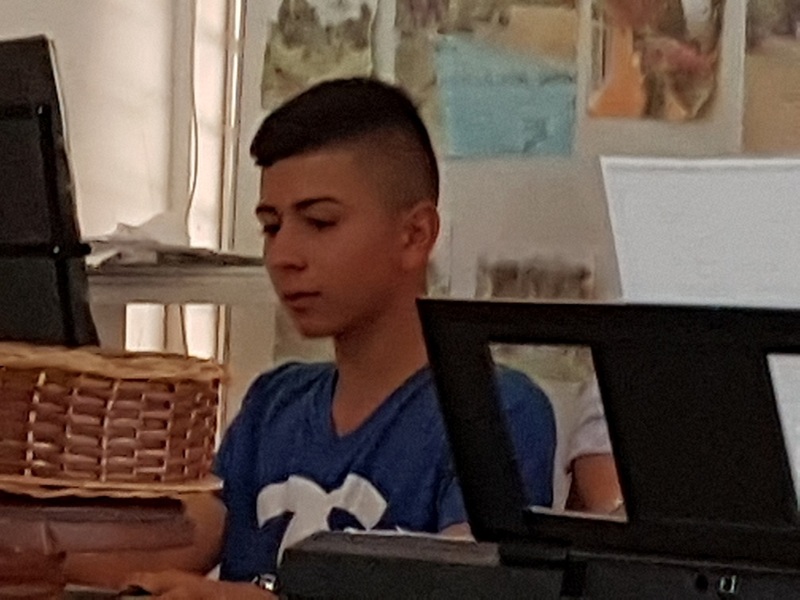 You might have heard Thanney tell the story: Pedro, an addict from 10 years old, on solvents, crack cocaine, such a hard young man, eyes like black bullets. It had totally destroyed the family, but thankfully, that day, the whole family had turned up at Reconocer’s family meeting. So, to sum up…. Let it rain…. How? How to sum up these increasingly amazing trips to the open heaven – and, if you’ve read or seen the news – literally open heavens with waterfall-like rainfall, tragedy, death, and triumph…. Coming here with just Thanney, as dear Davy had to drop out quite late, made it the smallest ‘team’ I’ve brought here in many years. I guess team numbers run into the many hundreds, now, but it all worked out well, and Thanney, with his vision for this new ‘level’ on the top of the El Abrigo Church Children’s Foundation, more than excelled himself, bearing in mind the limitations put on us by money not arriving (it still hasn’t!! ), by the unbelievable weather, and many other factors, that made Thanney feel that, with a week to go, and no structure erected at all, it couldn’t possibly happen…. God’s not only the God of healing miracles, he answered prayer for Thanney’s hands to cope with double – quadruple – the amount of work per normal. AND he worked long into the darkness, three floors above the ground, with – last week – a good little team of local guys helping him, with only Orlando skilled (welding), who did what he told them…. Thanney carried the plans in his head, I have no idea how, and the final structure, ready for phase two, is rock solid, and COMPLETE! A genuine miracle…. I’m in awe of what God and Thanney, and some other willing hands, have achieved here: it’s remarkable. Of course, there were the abundant miracles and healings in meetings, too – from cancers to Parkinsons to osteoarthritis to diabetes to paralyis to spine damage…. many have been ‘blogged’ already, so I won’t repeat them here, save to say that there were many: and in a number of churches, it was mind-boggling the speed with with God moved, in bringing healing, or the miracle, into a person’s life. Last Wednesday, there must have been 10 in 20 minutes, and that includes getting to know each person a bit, asking what’s wrong, and praying! The same Thursday, and Saturday…. Sunday too. Wilmar and I often sat, almost jaw-dropped, as person after person said ‘I’m healed’, ‘My pain has gone’….. it’s been wonderful. While the rain has been devastating south of here, in Mocau, Putamayo, it’s not had the same destructive effect where we are. But one of the things I love about this city is the thunder storms (tormentas – great word, huh?) – the thunder is incredibe, it’s deafeningly loud anyway, but, with Cali sitting 1300 metres or so up in the Andes Mountains, the thunder bounces of and rolls around the mountains, the lightning often massive forks, and it’s amazing to watch and listen to! I didn’t know the rains had come early this year, until the day Thanney and I walked out Cali airport on 14 March, and I’d been feeling, leading up to the trip, to talk about 1 Samuel 7, God thundering with a LOUD thunder at the enemy, defeating the Philistines, and giving the children of Israel the promise that – up until now, he’s helped them – and with the unpoken, but very real, ‘from now on I’ll continue to help you’ (perhaps Psalm 23:6 is the follow on verse!). After 18 months of not seeing my great friend, Dario, and his lovely family, they turned up here at the apartment last night, to take us out to eat. It was SO amazing to see them, and ‘topped’ this trip with the extra special privilege of being with them, and praying for them. July trip, we’ll get more time together…..
AND, of course, this visit to my ‘home’ carried special significance for me. After 16-17 years of osteoarthritic knees afflicting my poor – now very bowed – legs (where was my horse?? 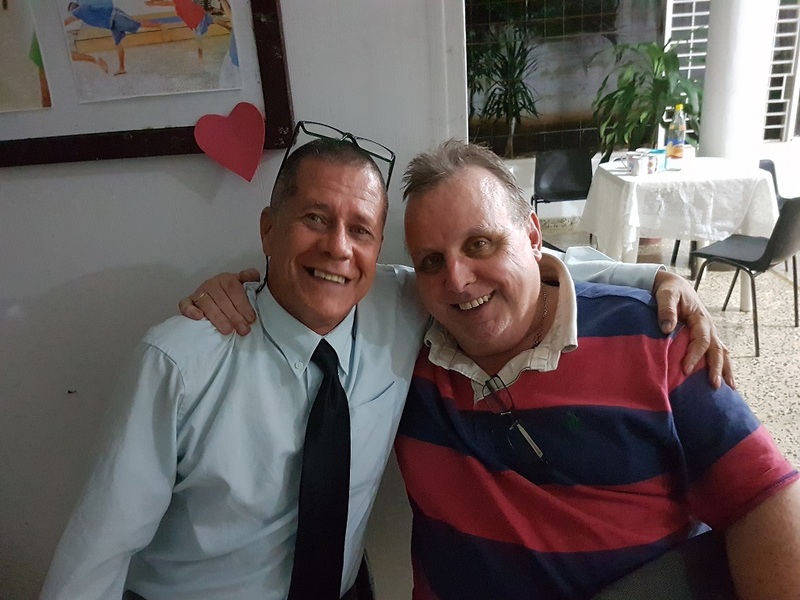 ), after the wonderful prayer and honouring from long-time friends in Mision El Abrigo Church, the miracle is underway…..normally when I get home from a trip away, I can’t – literally – move for a good 48 hours, and the last ‘leg’ home is generally excruciating, legs that don’t want to bend or move at all….today is so, so different. Thank you, wonderful Jesus: while I’ve never doubted that this is possible, and always believed it WILL happen, it still took me by surprise when it did…. you are SO SO good and faithful, Jesus, and I could never, ever imagine what I’d do without you…. Today, the whole family were there: Pedro playing keyboards in the worship band, Sarah running around in pretty, trendy shoes – unaided – with perfectly straight feet… Thanney was able to chat with them, on video, and hear the story from each. I won’t post it here yet, as I want him to choose if he posts it first, but believe me, it’s wonderful…. I got chatting with a great guy named David (it’s pronounced ‘Davvid’ here) – a 4 month long resident at Reconocer: you’d never believe to look to look at him ,talk with him, that just 2 months ago, he was the most difficult, disruptive guy in the house. Enrique has worked miracles with him… got to pray with him and his dad, Jaime, who is due in for prostate surgery tomorrow. Praying that doesn’t happen…. :). Dacid got ‘green shirted’ today, but with a shirt a good couple of sizes too small (!) – but he was so chuffed it was wonderful to see. He was deported from the USA 7 years ago, because of drug incarceration, and as a result he hasn”t seen his daughter, Maylene, for 7 years: she’s 13 now. Please pray for him, that, in the the 3 year he has left before he can reapply to go to back to the States, God will keep him, protect him, and _ United States (dreadful) immigration service, will approve his application to be able to go back and see her, and care for her. There’s a lovely ‘ceremony’ for the guys who complete a period of time, trouble free, hassle free: Steven, a young man who, when he was taken in to Reconocer, was in such a bad way, he couldn’t walk, as rigor mortis had already set in in his feet and legs. He’s a story of triumph, grace, mercy, love, patience, and care. When he arrived, the other guys in the house had to sleep outside, as the smell of his rotting flesh was overpowering. To see him now, on his knees, worshipping and crying to God, is immensely moving. And to see him walking, normally, integrated with the other residents, is such a blessing….the ceremony is that they get given a special green ‘logoed’ polo shirt, which, to them, is precious, as it means they’re on their way out of the pit…. Thanney and I both spoke a bit this afternoon. The response was wonderful. Davvid and Jaime were blown away, and – it seems – for the first time in Jaime’s life – he responded to a Christian message in a way he’d never done before: he was ‘persuaded’ in a way that he’d never heard… he found Jesus this afternoon….